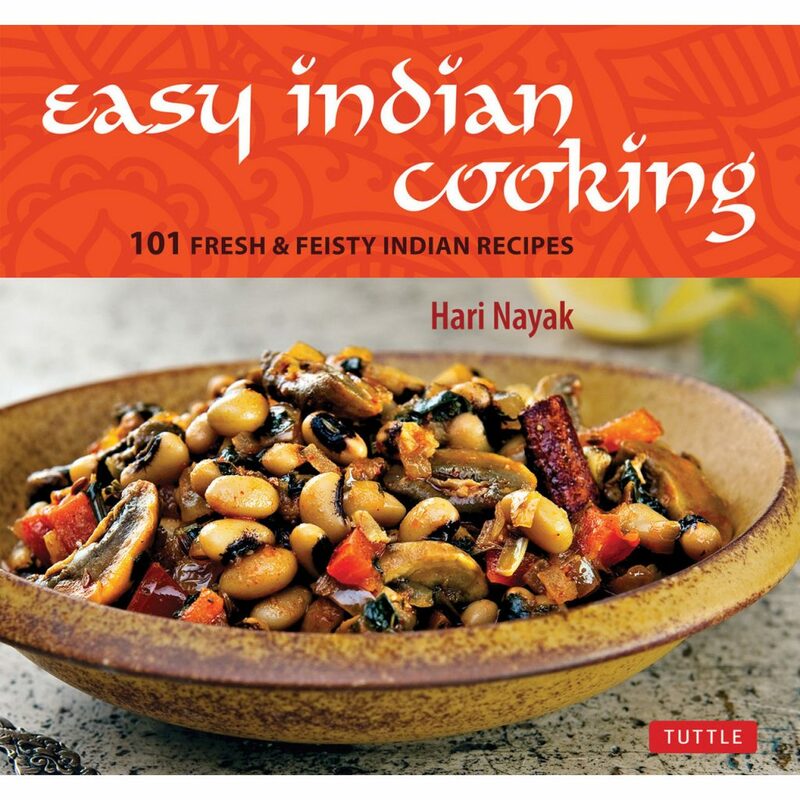 Easy Indian Cooking: 101 Fresh & Feisty Indian Recipes, written by Hari Nayak, features traditional Indian flavors with contemporary methods and presentations. Highlights include Paneer Picatta, Spinach and Thyme Roti Flatbreads, Tropical Fruit Salad with Chili Lime Vinaigrette, Classic Marinated Lamb Curry, Hot and Sour Chickpeas, and Salted Yogurt Lassi with Cumin. I will also be sharing Hari’s recipe for Cardamom Brownies at the end of the review. Disclosure: I received a copy of this book from Tuttle Publishing in exchange for my honest review. All comments and opinions are my own. This post contains affiliate links. Hari Nayak grew up in Udupi, India and developed his love of food by watching his grandmother in the kitchen. He is a graduate of the Culinary Institute of America and his career in the food industry has spanned over 18 years. Hari is now the culinary director for Café Spice and has a restaurant consultancy firm called Gourmet Gurus. He is also the author of Modern Indian Cooking, My Indian Kitchen, and The Cafe Spice Cookbook (reviewed in April). Chapters are divided according to course: Accompaniments; Appetizers, Soups and Salads; Poultry; Meat; Seafood; Breads and Rice; Beans; Vegetables, Eggs and Cheese; and Desserts and Drinks. The contents page also includes a list of the recipes in each chapter for easy reference. Hari begins with a basic guide to cooking techniques such as roasting meats and tempering along with helpful tools. The Ingredient Guide includes photos and descriptions for those who are unfamiliar with Indian cooking. After the introduction, he gets straight to the recipes. The photography is provided by Jack Turkel. Nearly all of the recipes are accompanied by quarter to full page photos of the finished dish. The titles are written in English with measurements listed in US Customary and Metric. Each recipe includes a headnote with background information and serving ideas, serving size, preparation, and cooking time. This book is a great pick for those looking for new ways to incorporate Indian flavors. Most of the recipes come together easily, often in 30 minutes or less, and are perfect for weeknight dinners. I especially enjoyed the flavorful assortment of sauces and condiments like the Pomegranate Mint Chutney and Plum Tomato Mustard Dip. While many recipes can be made with items found in the average American supermarket, having a specialty market nearby will be helpful in finding ingredients such as black mustard seeds, dried mung beans, star anise, sambal, saffron, mango powder, curry leaves, Asian eggplants, cardamom pods, nigella seeds, lemongrass, and semolina. 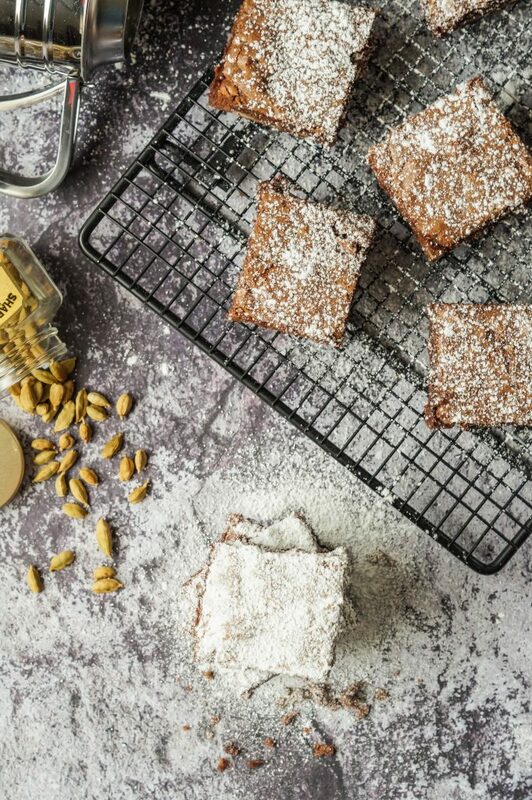 These Cardamom Brownies are perfect for the fall and winter baking season. 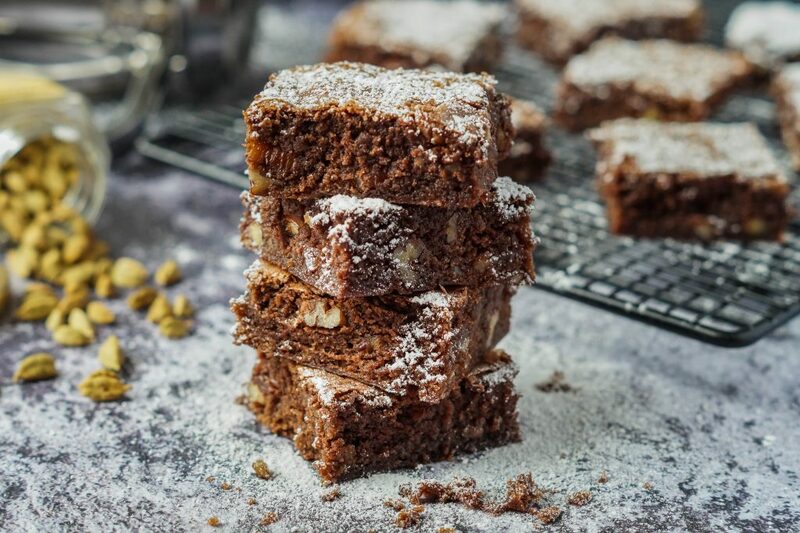 The basic, fudgy brownie base is taken up a notch with the addition of toasted pecans and freshly ground cardamom. I dusted the tops of the brownies with powdered sugar for a little contrast. Green Cardamom (Elettaria, Elaichi) originated in India and is the third most expensive spice, following saffron and vanilla. It is a highly aromatic, warm citrus-like spice similar to ginger and cinnamon. Most of the flavor is in the seeds encased by the green pods. You can buy cardamom whole or ground, but the seeds quickly lose their flavor once the pods are cut. I have been able to find green cardamom at World Market and other specialty spice stores/International Markets featuring Indian products. Many larger supermarkets carry ground cardamom. It is also available on Amazon: Cardamom Pods Green (Elachi)3.5oz- Indian Grocery . More information on green cardamom. I toasted the pecans in a single layer on a baking sheet in a 300˚F oven until fragrant. 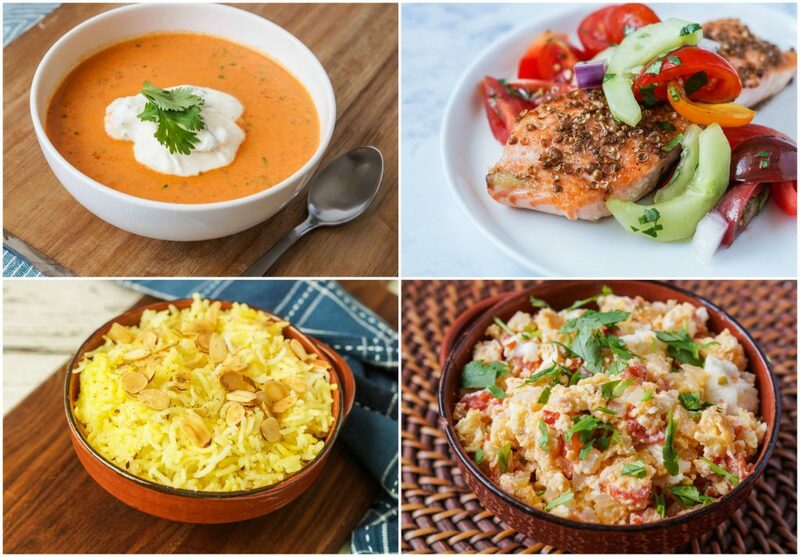 I also made the Fresh Tomato Soup with Cilantro Cream, Coriander Crusted Salmon with Cilantro Cucumber Chutney, Saffron Rice with Toasted Alomnds, and Masala Scrambled Eggs with Crumbled Paneer. The Fresh Tomato Soup with Cilantro Cream was a perfect ending to summer. The creamy tomato soup base is topped with a homemade cilantro cream. The light and refreshing soup comes together easily in less than 30 minutes. The kids really enjoyed it paired with grilled cheese sandwiches. The Coriander Crusted Salmon with Cilantro Cucumber Chutney is another quick and easy meal. Salmon fillets are seasoned with crushed coriander seeds and garam masala, cooked through, then served with a fresh cilantro cucumber chutney and lime wedges. The Saffron Rice with Toasted Almonds is a 15 minute rice dish seasoned with saffron, ginger, cumin, cardamom, garam masala, and almonds. Hari recommends serving it with his Spice Stuffed Okra and Cannellini Dal Fry. The Masala Scrambled Eggs with Crumbled Paneer was the quickest meal of all. Eggs are scrambled into a mixture of tomatoes, onions, chili peppers, and garlic, then tossed with crumbled paneer and cilantro. It was a huge hit with the whole family. I loved Hari’s idea of serving the scrambled eggs in a wrap for an easy meal on the go. Butter a 9×12 inch (23×30.5 cm) baking pan, fit the bottom with a piece of parchment paper and dust the inside of the pan with flour; tap the excess flour out and set aside. Melt the chocolate in a bowl over simmering water or with a microwave oven. Remove the chocolate from the heat and let it cool slightly. Beat the butter in a large mixing bowl with a flexible rubber spatula until smooth and creamy. Stir in the chocolate. Gradually add the eggs one at a time. Whisk and then add the sugar and ground cardamom, followed by the flour and pecans, stirring using a whisk until all the ingredients are incorporated. Do not beat or aerate. Scrape the batter into the baking pan and smooth the top with a spatula. Bake for 20 to 25 minutes. The top of the brownies will be dry, but a knife inserted in the center will come out wet with batter on it. Transfer the pan to a cooling rack and allow the brownies to cool for 30 minutes. Run a knife around the edges of the pan and untold the brownies. Remove the baking paper, cut the brownies, and serve. How fun! I love using cardamom in baked goods! These brownies look fabulous! I love the ‘fiesty part of the title of the cookbook! Sounds fun and enticing! These look so yummy. Can’t think of anything better than one of these brownies with my coffee right now! I am really intrigued by these..I love the addition of the cardamom! I really want to try this next time I make brownies…they look perfect! Yum, I love Indian food. 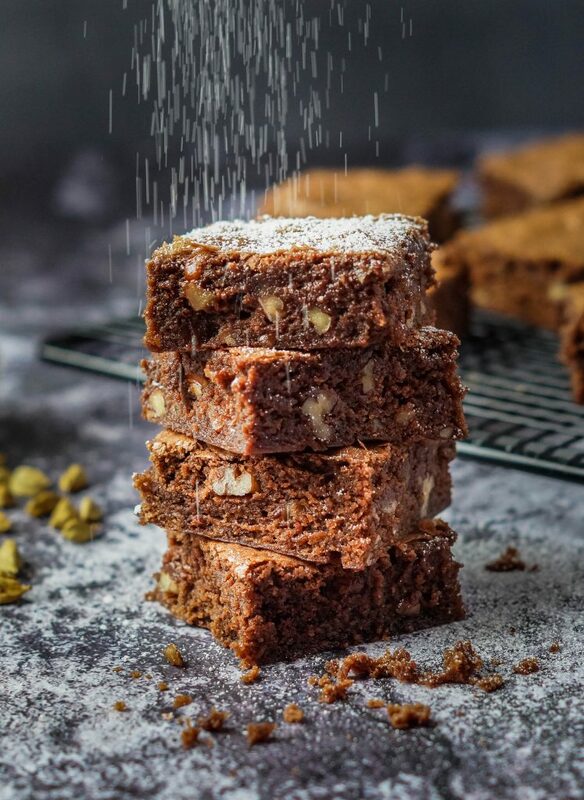 These brownies sound and look delicious. Love the addition of the cardamom!